« Results Are In – Setup File is Firmware. The magicJack plus uses very little electricity to keep going — about five volts continuous. There was a discussion on one forum (link below) about how much it costs just to ‘keep the lights on’ for mJ. To find out exactly, I used my Kill-a-Watt EZ. Originally, I’d left it programed for $0.049 per kilowatt hour (KWH) and came up with the number of $1.71 per year, based on leaving the device running for a week under normal conditions. Except we’ve got this weird tiered payment system. This estimate had to be too low, so I gathered original receipts, found out how many KWH’s total we used for a typical year, found out how many of those KWH were in each tier. I summed KWH’s, and total costs paid, divided the latter by the former and found we’re paying closer to $0.069 per KWH on average, not including taxes and other fees. 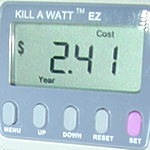 Since the Kill-a-Watt EZ can only take one number, I used $0.069 as my rate and found that we are instead paying about $2.41 per year too keep the magicJack plus lit and available. That means about twenty cents per month, just over four cents per week or just over half a cent per day. Of course this doesn’t include cost of ISP, any power company taxes or other costs involved, but it does give a fairly precise estimate of what the electrical KWH cost in my area. Forum thread discussing possible electrical costs.